Director – John McTiernan, Uncredited Additional Scenes Directed by Michael Crichton, Screenplay – Warren Lewis & William Wisher, Based on the Novel Eaters of the Dead by Michael Crichton, Producers – Michael Crichton, John McTiernan & Ned Dowd, Photography – Peter Menzies Jr, Music – Jerry Goldsmith, Visual Effects Supervisor – John Sullivan, Visual Effects – Cinesite (Supervisor – Jerry Pooler), Special Effects Supervisor – Thomas L. Fisher, Makeup Designed & Created by Jeff Dawn, Production Design – Wolf Kroeger. Production Company – Touchstone. The poet Ahmed Ibn Fahdlan is banished from Baghdad by the Caliph for consorting with another man’s woman. Fahdlan travels north into the lands of the Norse where he encounters a group of Vikings. When a call for help comes from a neighbouring village, a mystic chooses twelve men to fight – a thirteenth that is not Norse is required and Fahdlan chosen. The thirteen travel to a remote village that is besieged by fearsome non-human warriors that devour the flesh of the dead. Fahdlan makes the discovery that the creatures are human and leads the warriors on a journey into their cave lair to stop the menace. The 13th Warrior finally arrived on cinema screen following a muchly troubled production history. One had ominous premonitions about the film when they heard that Disney/Touchstone had forced a change from the title of Michael Crichton’s original novel Eaters of the Dead (1976) to the much blander The 13th Warrior. One gets the impression that Disney brought the rights to the book after Michael Crichton suddenly became a hot name with the success of Jurassic Park (1993) and when they sat back and thought about what they had on their hands suddenly developed cold feet about the Disney name being associated with anything that suggested cannibalism. Shooting overran and original novelist/producer Michael Crichton was forced to assume the director’s chair after director John McTiernan had to leave due to contractual obligations to shoot The Thomas Crown Affair (1999). The release of the film was then held up for over a year – enough time for John McTiernan to shoot, complete and release Thomas Crown. During this time, the shape of the finished print was editorially fought over by McTiernan, Crichton and Touchstone. And after being released, The 13th Warrior stormed a welter of mostly negative reviews to do only middling business with little hope of recouping its $110 million investment. (You can guarantee if Touchstone had had the courage to go with Michael Crichton’s Eaters of the Dead title instead of The 13th Warrior they would have filled a good many more theatre seats). It is hard to work out exactly what ended up on the cutting room floor. 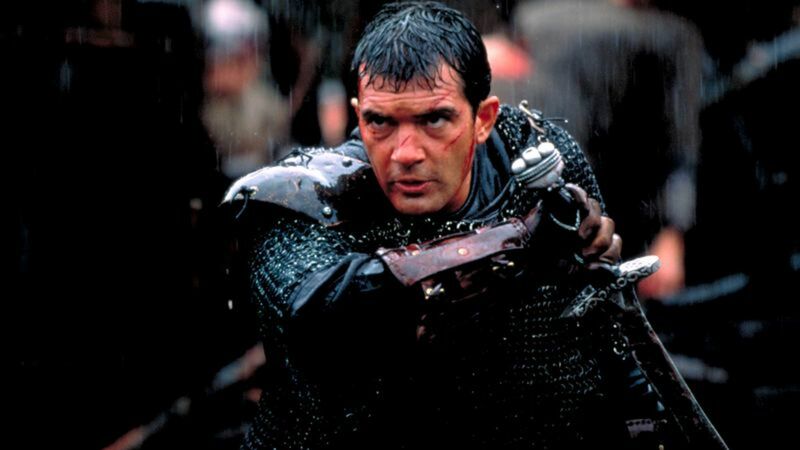 (One suspects that The 13th Warrior is a film whose reputation is going to flourish through director’s cuts). Michael Crichton wrote Eaters of the Dead combining two interesting stories – that of the true historical Persian adventurer Ahmed ibn Fahdlan who ventured up into the Norse lands, and the epic legend Beowulf where he ingeniously explained the Grendel monster away as a tribe of heldover Neanderthals. Whether Michael Crichton is talking about viral containment facilities, protocols for alien contact, dinosaur DNA, sexual harassment law or air traffic accidents, any Crichton novel always comes with screeds of research on the subject – and Eaters of the Dead was filled with much detail about Viking and Persian cultures and speculation about Neanderthal tribal behaviour. However, The 13th Warrior ditches much of the detail from the book. One suspects that this is an editorial decision rather than any sweeping scripting decision – in order to place the emphasis in the film on the battle sequences. All we see of Baghdad is a flashback of less than a minute. (Certainly, the film piques one’s interest if for no reason other than that there were no releases out there at the time that featured a Muslim or an Arab in anything other than a villainous role). There are some intriguing Crichton-esque glimpses into both cultures at the start of the film – the boy who stands clear to show he is not an illusion of the mists, the Viking cleansing rituals and touches of Fahdlan’s Islamic background but most of the cultural/historical background gets swept aside once we get into the battle scenes. More importantly, the film never explains anything about the Eaters being Neanderthal holdovers. In fact, there is now nothing whatsoever apart from the later dispelled speculations that they are inhuman monsters that categorises The 13th Warrior as science-fiction as opposed to an historical epic. A number of reviewers jumped on various aspects of the film – the lack of characterisation and the production problems – to run it down. For the most part however, The 13th Warrior works well. In the 1990s, alongside James Cameron, John McTiernan was one of the finest American action directors – with powerhouses like Predator (1987), Die Hard (1988), The Hunt for Red October (1990) and the great action movie satire Last Action Hero (1993) under his belt, as well as the immensely underrated urban ghost story Nomads (1986). John McTiernan has yet to make an entitrely bad film – although Medicine Man (1992) and Rollerball (2002) do come close. Unlike other action directors such as Renny Harlin and Michael Bay, McTiernan emphasises believability over the ridiculously spectacular. McTiernan has crafted The 13th Warrior as one of the new muddy and bloody historical epics post-Braveheart (1995) and the battle scenes are grim and brutal affairs. The Northern landscape looks suitably desolate and the photography, often by firelight, very good. The sense of mystery as the warriors confront the inhuman nemesis and venture into their lair is well sustained. 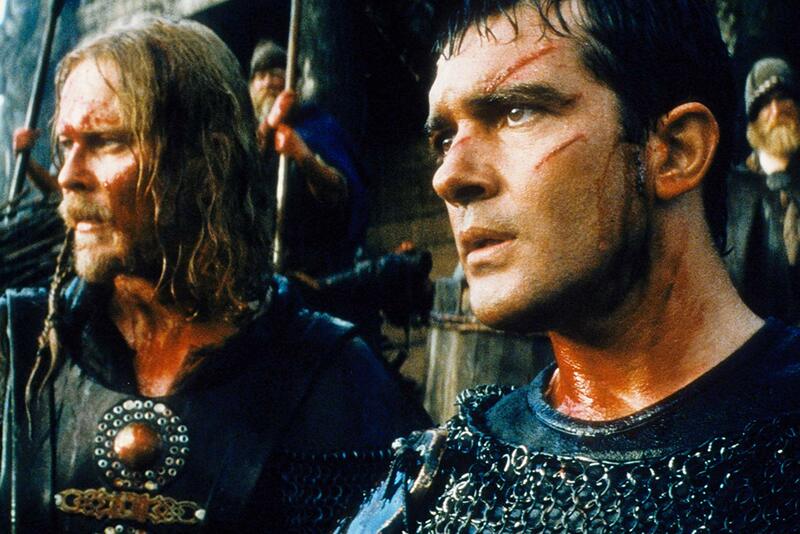 Despite the validity of the accusation of lack of characterisations, the Viking supporting characters, particularly Valdimir Kulich as the Beowulf counterpart, comes across as stronger than the uncustomarily quiet and closed-off Antonio Banderas. Also of interest is Outlander (2008), another film that transplants the story of Beowulf into Viking culture and features a science-fiction rationale where Grendel becomes an alien monster, while the same year as this also saw the bizarre Beowulf (1999), which transplanted the story to a post-holocaust setting. A few years later saw a spate of more traditional adaptations of Beowulf with Beowulf & Grendel (2005), Grendel (2006), the animated Beowulf (2007) and Beowulf: Prince of the Geats (2007). Other films adapted from Michael Crichton’s books include the extra-terrestrial virus film The Andromeda Strain (1971); the neurosurgical Frankenstein film The Terminal Man (1974); Jurassic Park (1993); Rising Sun (1993), an adaptation of Crichton’s blatantly racist book about Japanese business practice; Barry Levinson’s adaptation of Disclosure (1994), Crichton’s novel about sexual harassment, which contains some science-fiction elements; the lost world film Congo (1995); The Lost World: Jurassic Park (1997); Levinson’s underrated Sphere (1998) about the investigation of a crashed UFO; Richard Donner’s dull adaptation of Crichton’s Timeline (2003) about time travel to Mediaeval France; the tv mini-series remake of The Andromeda Strain (2008); and the tv mini-series remake of Westworld (2016– ). Michael Crichton’s films as director include:– Westworld (1973) about an android amusement park that goes amok; the medical thriller Coma (1978); The Great Train Robbery (1979) about a Victorian train heist; Looker (1981) about virtual models; Runaway (1984) about a police force to stop amok robots; and the courtroom thriller Physical Evidence (1989). Crichton also created the hit hospital drama ER (1994-2009) and wrote the original screenplay for Twister (1996) about tornado chasers. (Nominee for Best Cinematography, Best Musical Score at this site’s Best of 1999 Awards).